With the first edition of the Food Lover’s Guide to Portland, writer Liz Crain filled a need, pulling together a list of the best food purveyors in Portland, and giving gentle reminders to the bounty that is our amazing food scene. This new, second edition expands on it, with over thirty new full listings, 150 new businesses, a food cart chapter by Brett Burnmeister of Food Carts Portland, and a Hispanic Market section from all around foodie Nick Zukin. This is more than a listing of foods and sources. 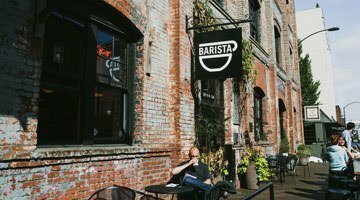 Most of the businesses are accompanied by a bit of a story about the people behind them and what makes them unique. The end result draws the reader in and makes you want to know more. Peppered throughout, are interesting ingredient profiles (lamprey anyone? ), along with business owner Q&A’s, a fun but incongruous list of local chefs and their tattoos, and a long list of local food resources. 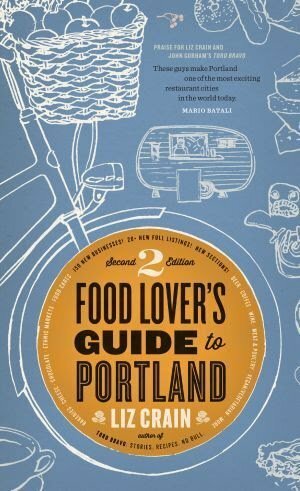 Liz Crain brings the city to life, and makes Food Lover’s Guide to Portland an enjoyable read from cover to cover. If I want to be picky there are a few things that were annoying, but I had to dig deep to find them. First, the order of sections. Under food, the chapters go Bakeries, Cheese, Chocolate, Ethnic Markets, Food Carts (with the Food Innovation Center stuck in the middle of that section), Sweets, Co-Operative Groceries, etc. It’s just a bit chaotic, and I found myself thumbing back and forth trying to follow it. Choices of what businesses are featured and what are just in sidebar lists are also a bit confusing. For instance, ZBeanz is given prime real estate, but only receives two sentences, yet some roasters like Extracto or Water Avenue are never mentioned. On the other hand, the scatter shot approach is one of the things that makes this book fun to browse, and there is a good general index if you are looking for something specific. Finally, though I can only imagine how difficult it is to keep a book like this current, there are a few places that have been closed for some time that have slipped through the cracks. These quibbles are minor. Overall, I enjoyed reading the new Food Lover’s Guide to Portland. It reminded me of businesses I had forgotten about, places that slipped under my radar, and what a great food city we live in. Pick it up on a slow Sunday afternoon, and you’ll end up heading out the door with car keys in hand. You’ll find it at Powell’s, Annie Bloom’s, or wherever good books are sold. Liz Crain is the author of Food Lover’s Guide to Portland and Toro Bravo: Stories. Recipes. No Bull. A longtime writer on Pacific Northwest food and drink, her writing has appeared in Cooking Light, Budget Travel, VIA Magazine, The Sun Magazine, The Progressive, The Guardian and The Oregonian. She is also an editor and publicity director at Hawthorne Books as well as co-organizer of the annual Portland Fermentation Festival. Category: Authors / Book Reviews, Food Writing. More about Liz Crain. Funny, I thought Zbeanz had been closed for over a year now.